AnyMP4 iPod Converter is the professional iPod Converting software, which can rip DVD and convert all popular video files to iPod compatible video formats at the same time, and it is a useful tool for you. disposal. And you will have an amazing experience with this professional software. Webcam Surveyor is all in one webcam software solutions includes: video surveillance, capture, video broadcasting and monitoring tools. Aiseesoft DivX to DVD Converter is able to help you burn DivX, MPG, MPEG, MPEG-2, MJPG, MJPEG, MP4, MOV, M4V, MPV, MOD, and DAT video to DVD disc, DVD folder and DVD ISO files. Elecard StreamEye tools are powerful applications designed for professionals and prosumers in the video compression field. Elecard StreamEye tools enable the user to perform an effective in-depth analysis of video sequences. Ants DVD to iPod Converter can convert DVD Movie Chapters to MP4 of H.264 or MPEG-4 codec for playing on iPod Video or iPod Classic. 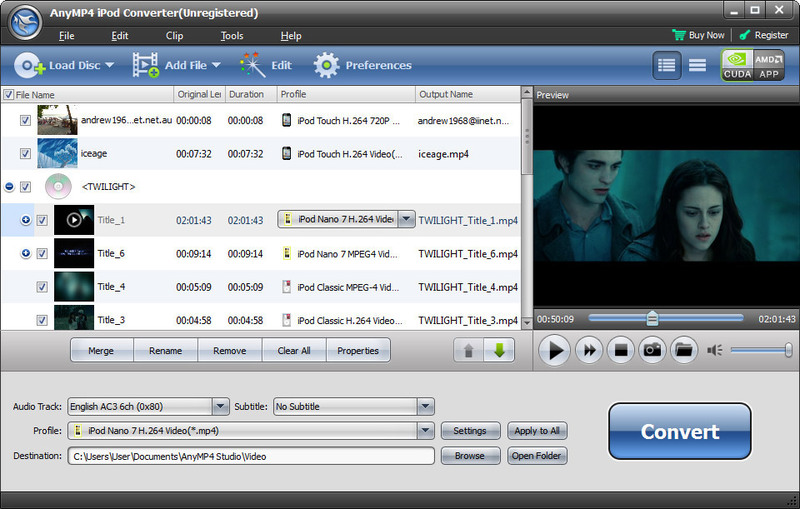 It can also extract audio tracks from DVD Movie to MP3 or M4A for iPod Video, iPod Nano, iPod Touch, iPod Classic, ..